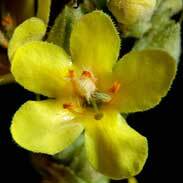 In herbal medicine we use the flowers and leaves of Mullein, a tall plant that grows and lives for two years. Mullein produces long, thick, hairy leaves in a rosette at its base and then in its second year shoots up a tall spike bearing yellow flowers that can reach to over 3 meters. Ancient cultures around the world considered Mullein a magical protector against witchcraft and evil spirits and, like many such herbs used in magic, Mullein has a long history as a healing plant. Mullein was described as a treatment for ‘old coughs’ by the Greek physician Dioscorides over 2000 years ago and has chiefly been used as a herb for lung problems since well before then till now. Culpeper wrote that gargling Mullein 'easeth toothace and old cough' and, in 19th century Ireland, Mullein was considered a leading remedy for the tuberculosis that plagued many of the population and large amounts of it were cultivated for this particular purpose. 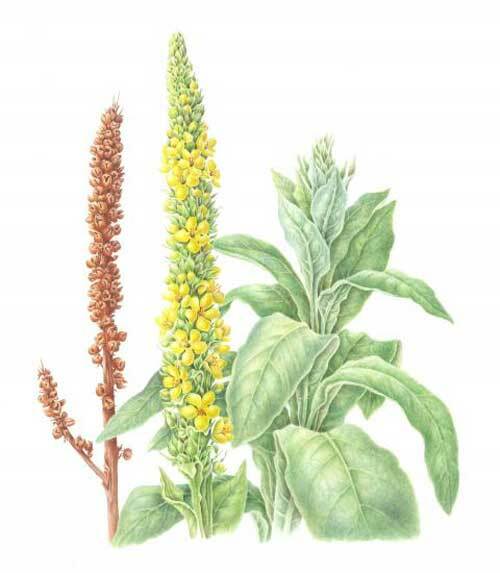 The British Herbal Pharmacopoeia (BHP) describes the actions of Mullein as 'expectorant, demulcent, mild diuretic, topically vulnerary & emollient'. It says it is indicated for 'bronchitis, tracheitis, influenzal cold with respiratory catarrh' and specifically indicated for 'bronchitis with hard cough and soreness'. The BHP recommends a dose of 4-8 grams or by infusion. 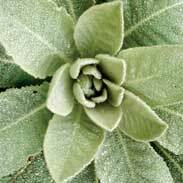 Thomas Bartram writes that the actions of Mullein include 'a soothing relaxant for irritable respiratory conditions, pectoral demulcent, anti-tussive, mild sedative, diuretic, vulnerary, mild antispasmodic'. He suggests uses for it including 'asthma, deep hollow cough, emphysema, tracheitis, hay fever, wet pleurisy & bronchitis' Bartram recommends a tea from 2-3 tsps of herb steeped for up to 15 minutes and a dose of half to 1 cup of this as neeed. 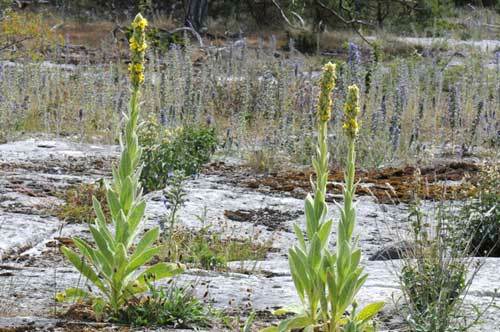 A heaped tsp of Mullein is about 2/3rds of a gram. There have been no clinical trials with people using Mullein, but it has had some interest in the scientific community nevertheless and has shown antimicrobial activity against strains of Staphylococcus aureus and Trichophyton mentagrophytes. The antibacterial activity of mullein was observed with Klebsiella pneumonia, Staphylococcus aureus, Staphylococcus epidermidis and Escherichia coli. Mullein contains a mucilaginous substance that swells and becomes slippery as it absorbs water, and this may account for at least some of its soothing action, whilst at the same time its saponin-bearing constituents and volatile oils cause it to have a cleansing action on the lungs. Some increase in coughing and cleansing of the lungs is to be expected with Mullein when it is taken for respiratory troubles but this is not at all a bad sign, rather a sure indicator that the herb is doing its job! 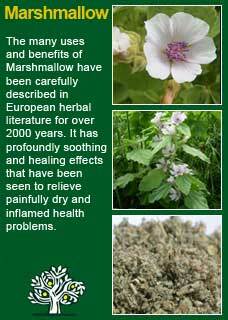 Otherwise no adverse effects are expected from taking Mullein, even in high or frequent doses. It may be confidently taken during pregnancy or whilst breastfeeding and used by the young or old with safety. The pronounced relaxing, soothing and cleansing properties of Mullein make it one of my top favourite herbs to use for people who are having all kinds of problems with their breathing. 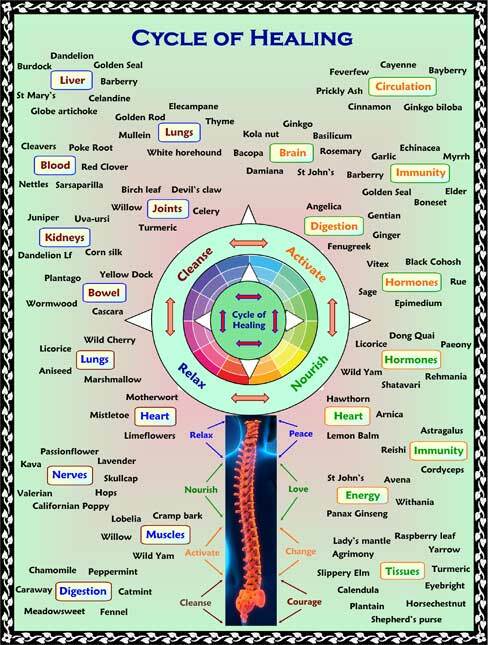 If you who are reading this are studying herbal medicine or if you just have your own reasons to want to get to know this plant ally at a much deeper level then I recommend you to make and take some Mullein tea or take a small dose of its tincture and then, with a quiet and attentive mind, observe for yourself how it makes you feel. If you have the dried herb, then I suggest you have a good sniff of the leaves before you add the hot water and see if it does to you what it almost infallibly does to me - which is to give a really good sneeze. In fact if you have something in there that needs cleaning out you might get more than one! 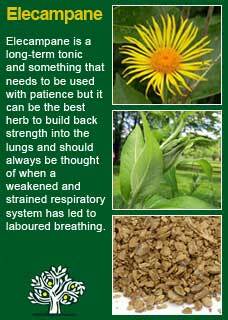 This is the first clue to how this herb works, as you drink the tea, or as the tincture penetrates into your system, I think you will be able to feel for yourself just why it was turned to for help for such awful breathing problems as chronic tuberculosis. 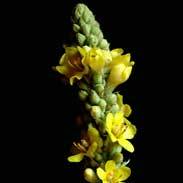 Mullein has pronounced soothing and relaxing properties. When we get caught with a chronic respiratory condition we nearly always have some debris (even the tiniest amount will do it) stuck somewhere in the lungs or bronchials. The body is intimately aware that it is there and will not cease in its efforts to expel the offending article until it is gone. Mullein combines just enough of an irritant to trigger an increased release of the sneeze or cough reflex and at the same time it calms everything down so it hurts less to get the job done. 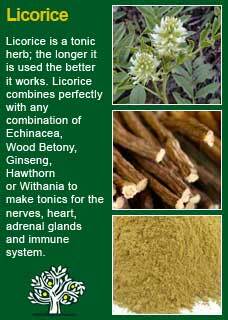 Mullein combines perfectly with Marshmallow for painful coughs, with Elecampane for deep lung congestion and with Licorice root for soothing the bronchial tract. This is a tea formula that I've developed over the years for a tonic and cleansing action on chronic respiratory weaknesses such as asthma, chronic bronchitis etc. It's reasonably palatable and highly effective! *This gives enough for a small jar and quite a few cups of tea. Of course the overall amount can be made larger or smaller as needed by just adjusting the proportions of all the herbs up or down. Instructions: Pour 1 cup of boiling water over 3 heaped tsps of herbs (adding honey is optional at this point). Cover and allow to steep for 10 minutes. Strain the tea, sip hot and breathe deep. Gently heat 1 pint (600mls) of Olive oil in a non-aluminium vessel. Gradually add fresh Mullein flowers to the warm oil until the mixture is saturated. Continue in gentle heat until all the colour fades from the flowers. Press out the oil through some cloth (such as muslin) and bottle. Much of the information here about the traditional uses of Mullein is consistent with the model of thinking whereby one may treat problem A with plant B. There is value in this approach, especially in how it helps us pass on useful knowledge to one another, but it falls short in one vital area; and that is that people are not all cut from the same cloth! Something that works brilliantly for one person may do less for another -- why is this?